There’s a rule of thumb in the graphic design business: if you want the magazine to sell, put a pretty face on the cover. This is my 25th trip into my personal Cinefex archive, and well over half the covers I’ve looked at more or less follow that rule (remember, in the world of visual effects, even Ray Harryhausen’s hideous Medusa from Clash of the Titans is way past pretty and into the realms of gorgon-gorgeous). This time around, the good looks belong to the alien Drac, played by Louis Gossett Jr in Wolfgang Petersen’s 1985 science fiction film Enemy Mine. The back cover features the equally attractive vampire Jerry Dandridge from the original Fright Night. Altogether, this issue contains three articles, spanning 72 pages. 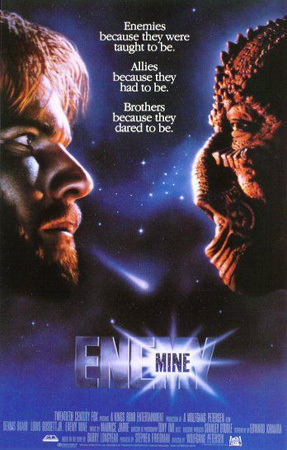 Like the alien character in its story, the futuristic drama Enemy Mine suffered a painful birthing process. The film was up and running with writer/director Richard Loncraine at the helm and four weeks of location shooting under its belt before Fox – ‘no longer confident that Loncraine was the man for the job’ – halted production. This isn’t the first Hollywood false start Cinefex has chronicled, but with what writer Janine Pourroy describes as ‘a $9 million write-off tacked onto the now doubled budget’, it’s surely one of the most expensive. Loncraine’s original version of the movie got so far into production that the first five pages of Pourroy’s article are entirely devoted to it, making this an intriguing glimpse of a movie that never was. We hear how Chris Walas spent a ‘very intense period’ developing the original Drac make-up and suit for what he refers to as ‘Enemy Mine I’. He then endured ‘an amazingly grueling experience’ shooting in Iceland before going back to the drawing board in order to realise Petersen’s new vision for the character. Luckily for us, Cinefex has photos of both the ‘before’ and ‘after’ alien make-ups, giving us the unique opportunity to judge for ourselves which one we prefer. The discussion continues deep into territory concerning the integration of live action and animation elements with the paintings, the benefits of latent image over optical compositing and the tapping of Harry Walton’s expertise in a specialised masked printing technique. In short, it’s a fully-featured guided tour of ILM’s matte painting department back in the days when brushes were made out of sable and the pigments came out of a tube. Nowadays, globalisation is commonplace, and can even work to a production’s advantage. A director can shoot all day on a Los Angeles sound-stage knowing that when he (eventually) goes to bed his VFX crews in London and Sydney will be discussing the new footage over breakfast. Back in 1985, things weren’t quite so simple, which makes Petersen’s decision to support his native film industry all the more laudable. Every so often, Cinefex throws us an article out of left field. In issue #25, we’re treated to a potted history of German effects written by Rolf Giesen (who has to his name an impressive list of books on this and related subjects). The article complements the preceding Enemy Mine piece rather well, concluding as it does with a brief mention of Wolfgang Petersen’s Das Boot and The Neverending Story. The German connection, presumably, is why the two articles appear side by side. Starting at the very dawn of cinema, the text takes us on a lightning tour of some of the milestones in German ‘trickfilm’. 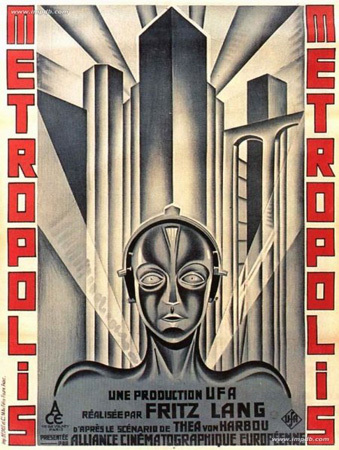 The insights into Fritz Lang’s seminal Metropolis are naturally of great interest, but so too are Giesen’s notes on less famous films, including the very early Der Student von Prag (The Student of Prague) and Lebende Buddhas (Living Buddhas). If you’re a fan of early cinema, you’ll love Giesen’s clear, concise descriptions of a number of old-school effects including half-silvered mirrors, the Shuftan process and an early optical printer called the Truca. If you’re more interested in the here-and-now, you may smile when you spot a passing reference to a young, up-and-coming director described as part of ‘an emerging generation of filmmakers in Germany excited about rekindling the interest and challenge of cinematic special effects.’ His name? Roland Emmerich. Emmerich’s subsequent success shows Giesen was right to single him out. Even so – and despite Germany’s great cinematic heritage – the country isn’t known as a big player in the modern visual effects business. This recent article in the Chicago Tribune suggests that might be about to change, as companies like Celluloid, Exozet, Pixomondo, Rise, Scanline and Trixter take advantage of beneficial exchange rates and low overheads – not to mention Oscar-winning talent – in their quest to create the same kind of VFX community that’s grown up in London over the past decade. It’s encouraging to see that, in the land of the Black Forest, Lang’s legacy is alive and well. Not all directors take an active interest in visual effects. 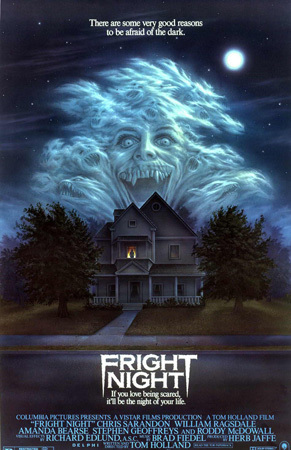 Fright Night‘s Tom Holland, it seems did. BFC art director John Bruno remarks that he came up with ‘some very good and elaborate ideas.’ The restricted budget forced Bruno to curb a little of Holland’s enthusiasm, however, revising ambitious shot designs to be more achievable and favouring in-camera techniques over optical composites. The conservative approach didn’t curb creativity, however. Effects director of photography Neil Krepela lets us in on the tricks used to realise the film’s 90-second opening shot, which combines a live action crane move with a Matthew Yuicich matte painting. Randall William Cook describes the various make-up appliances – including finger extensions and ‘a full, one-piece, paper-thin mask – he created to turn Chris Sarandon into a vampire. And creature designer Steve Johnson reveals how he enhanced the figure of actress Amanda Bearse for her transformation into the vamped-up Amy. ‘I sculpted my dream breasts for her,’ he proudly announces. Flicking back through this issue of Cinefex, the pictures I’d pick out from the Enemy Mine article are the ones that show the film’s glorious matte paintings, especially those photos where we see the artists meticulously picking out intricate details on huge sheets of glass with tiny brushes. And, always a sucker for a melting head effect, I can’t fail to appreciate the behind-the-scenes shot of a rubber-and-gelatin replica of actor Jonathan Stark disintegrating before the camera while an entire effects crew, crouched just out of frame, heroically makes it writhe in agony. There’s many who would say that cinema today has not only realised Wegener’s dream, but gone beyond it. There are others who might argue that Hollywood at least is far too commercial to produce true art. When creating those ‘magical forests’ can easily cost $200 million, it’s tempting to say there’s nothing ‘pure’ about the process at all. But it can still be ‘lyrical’, can’t it? Optical lyric. I don’t know what the original German was, but it’s a delightful turn of phrase. So about it, all you industry professionals out there? Given the choice, what job title would you rather have under your name? 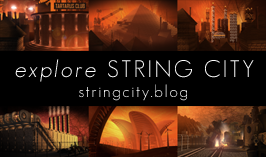 Visual Effects Artist? Or Optical Lyricist? I know which one would get my vote. 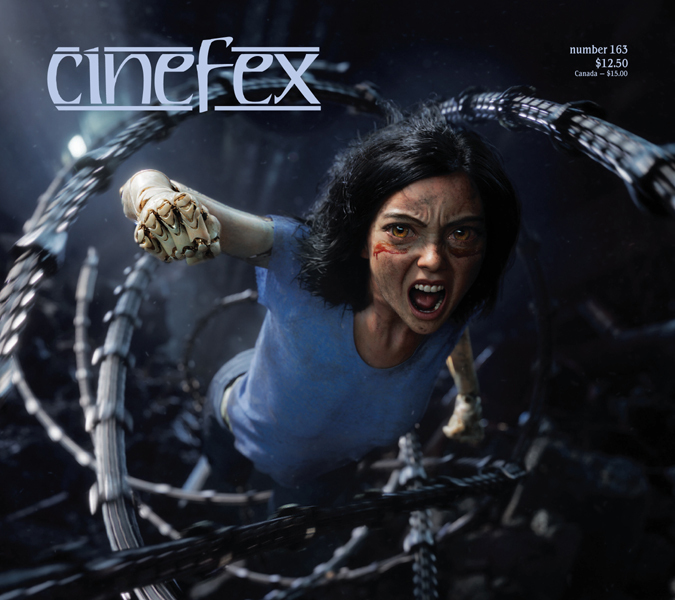 Did you enjoy this Cinefex retrospective? If so, click here to read the others in the series.